Although science has yet to prove a way to prevent the disease, some research suggest factors such as breast-feeding and vitamin D supplementation may have risk-reducing effects. The hypothesis that early exposure to cow’s milk or a lack of breast-feeding may predispose a child to T1DM dates to the 1980s.2 In 1994, the American Academy of Pediatrics (AAP) began recommending that infants with a strong family history of T1DM be breast-fed and that the introduction of cow’s milk be delayed.3 Since then, many researchers have examined this proposed mechanism. Ecologic studies have made several associations between early cow’s milk exposure and an increased incidence of T1DM. Several investigations have revealed a high correlation between the per capita consumption of cow’s milk and the prevalence of T1DM between and within countries.4-6 Scott evaluated milk consumption data from 13 countries and found a significant positive correlation with T1DM incidence.4 This research also found an inverse relationship between breast-feeding and avoidance of cow’s milk until the age of 3 months and diabetes risk among data from 18 countries. However, there is evidence that calls the causal implications of cow’s milk and T1DM into question. The negative correlation between the frequency and the duration of breast-feeding and T1DM was not seen in some studies.1 Some study authors have concluded that the increased incidence of T1DM was due to early introduction of solid foods within the first four months of life. According to the research team, the possibility that insulin-specific lymphocytes induced by cow’s milk feeding may be later activated in some children needs to be considered as a possible mechanism leading to the autoimmune destruction of beta cells and subsequent progression to clinical T1DM. Vitamin D has long been recognized for its role in bone and mineral metabolism. It is now also widely considered a regulator of growth and differentiation in many target tissues and an immune system modulator.12 Population studies have suggested that supplementation with vitamin D in early childhood may decrease incidence of T1DM. Experiments in nonobese diabetic (NOD) mice have provided strong evidence of a vitamin D effect on T1DM risk. Researchers say NOD mice experience disease pathogenesis similar to that of humans, including autoimmune destruction of the beta cells. A 1994 study by Mathieu et al found that T1DM was prevented when the researchers administered 1,25-dihydroxyvitamin D to NOD mice in pharmacologic doses. A 2004 study by Giulietti et al found that NOD mice raised in a vitamin D-deficient state developed diabetes at an earlier age than nondeficient NOD mice. The EURODIAB Substudy 2 Study Group published data from a large case-control study conducted in seven European countries in 1999. This study involved the parents of 820 children with T1DM and 2,335 population-based controls. The groups were interviewed to ascertain whether the children received supplemental vitamin D during their first year of life. If given, the type and amount of vitamin D were not determined. The researchers found that those who received supplemental vitamin D had a one-third reduced risk of developing T1DM by the age of 15. Stene et al conducted another large case-control study, published in 2003 in the American Journal of Clinical Nutrition. In this study, surveys including questions about vitamin D supplement and cod liver-oil intake during the first year of life were mailed. Cod liver oil administered to infants at least five times per week was associated with a significant reduction in T1DM risk compared with no supplementation. Interestingly, there was no evidence of a protective effect from other vitamin D supplements, even when taken five or more times per week. The reason for this difference is unknown; however, researchers speculate that the vitamin D in cod liver oil may be more bioavailable or that there are other components in the cod liver oil exerting influence. In 2001, Hyppönen et al published the first prospective study examining T1DM and vitamin D supplementation in infants.15 More than 12,000 pregnant women from Finland were enrolled in the study. Infants received vitamin D at the age of 1, and the researchers followed them for 25 years. The researchers found that infants who were given vitamin D supplements in amounts greater than 2,000 IU/day regularly had an 80% decreased risk of developing T1DM than those infants given vitamin D in doses less than 2,000 IU/day. Children who were vitamin D deficient had a fourfold increased risk of developing the disease later in life. In a review, Harris concluded that this large, well-designed study provides compelling evidence that vitamin D supplementation of 2,000 IU/day or more during infancy may reduce the risk of T1DM, at least in areas where sunlight is limited.16 This is almost 10 times the amount used in the Stene study discussed previously. Harris speculates that this drastic difference in dosage may be the reason for the somewhat contradictory findings between the studies. It may be that vitamin D prevents T1DM only in relatively large doses. Based on the available research, RDs should consider recommending a few dietary protocols to help clients potentially reduce risk for T1DM. First, RDs counseling pregnant women should discuss breast-feeding and its benefits. Breast-feeding may help not only reduce acute illness, such as the common cold and ear infections but also prevent chronic illness, such as T1DM. RDs should convey the message that breast milk is the most biologically appropriate infant food. The AAP recommends exclusive breast-feeding for the first six months of life, continued with supplemental foods for the first year or more of life. The World Health Organization recommends that women continue breast-feeding with supplementary foods through the second year of an infant’s life. Second, aside from encouraging women to breast-feed, RDs should advise parents to wait until an infant is at least 1 year old before introducing cow’s milk. Much research supports cow’s milk as being the antagonist rather than breast milk being solely preventative. Some women may find it challenging to continue providing ample breast milk for their infant when they return to work. RDs can assist working mothers by brainstorming ideas for pumping and storing breast milk. — Janice H. Dada, MPH, RD, CSSD, CDE, CHES, is a dietitian in private practice, college nutrition instructor, and freelance writer based in southern California. To keep up-to-date on the research surrounding T1DM, visit www.t1diabetes.nih.gov. 1. Schrezenmeir J, Jagla A. Milk and diabetes. J Am Coll Nutr. 2000;19(2 Suppl):176S-190S. 2. Harrison LC, Honeyman MC. Cow’s milk and type 1 diabetes: The real debate is about mucosal immune function. Diabetes. 1999;48(8):1501-1507. 3. Infant feeding practices and their possible relationship to the etiology of diabetes mellitus. American Academy of Pediatrics Work Group on Cow’s Milk Protein and Diabetes Mellitus. Pediatrics. 1994;94(5):752-754. 4. Scott FW. Cow milk and insulin-dependent diabetes mellitus: Is there a relationship? Am J Clin Nutr. 1990;51(3):489-491. 5. Dahl-Jørgensen K, Joner G, Hanssen KF. Relationship between cows’ milk consumption and incidence of IDDM in childhood. Diabetes Care. 1991;14(11):1081-1083. 6. Fava D, Leslie RD, Pozzilli P. Relationship between dairy product consumption and incidence of IDDM in childhood in Italy. Diabetes Care. 1994;17(12):1488-1490. 7. Gerstein HC. Cow’s milk exposure and type 1 diabetes mellitus. A critical overview of the clinical literature. Diabetes Care. 1994;17(1):13-19. 8. Norris JM, Scott FW. A meta-analysis of infant diet and insulin-dependent diabetes mellitus: Do biases play a role? Epidemiology. 1996;7(1):87-92. 9. Virtanen SM, Räsänen L, Ylönen K, et al. Early introduction of dairy products associated with increased risk of IDDM in Finnish children. The Childhood in Diabetes in Finland Study Group. Diabetes. 1993;42(12):1786-1790. 10. Vaarala O, Knip M, Paronen J, et al. Cow’s milk formula feeding induces primary immunization to insulin in infants at genetic risk for type 1 diabetes. Diabetes. 1999;48(7):1389-1394. 11. Hummel M, Füchtenbusch M, Schenker M, Ziegler AG. No major association of breast-feeding, vaccinations, and childhood viral diseases with early islet autoimmunity in the German BABYDIAB Study. Diabetes Care. 2000;23(7):969-974. 12. Nejentsev S, Cooper JD, Godfrey L, et al. Analysis of the vitamin D receptor gene sequence variants in type 1 diabetes. Diabetes. 2004;53(10):2709-2712. 13. Holick MF. Vitamin D: Importance in the prevention of cancers, type 1 diabetes, heart disease, and osteoporosis. Am J Clin Nutr. 2004;79(3):362-371. 14. Holick MF. The vitamin D epidemic and its health consequences. J Nutr. 2005;135(11): 2739S-2748S. 15. Hyppönen E, Läärä E, Reunanen A, Järvelin MR, Virtanen SM. Intake of vitamin D and risk of type 1 diabetes: A birth-cohort study. Lancet. 2001;358(9292):1500-1503. 16. Harris SS. 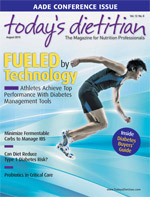 Vitamin D in type 1 diabetes prevention. J Nutr. 2005;135(2):323-325.